Problem viewing email? Click here to view it online. It is an honor and a privilege to be named interim president of Edinboro University. I want to assure you that as a community, we will continue to advance the university along a path to a promising future. Edinboro has a proud past and remains a very solid university that provides a high-quality education to its students. During the past two years, we have made significant strides to move our university forward. As just one example, we have raised admission standards, a change supported by both students and faculty. As evidence that we are making progress, in fall 2017, 90 percent of our incoming class had a high school GPA of 3.0 or higher. This is the highest percentage among Pennsylvania’s 14 state-owned universities for first-time undergraduates who enter the university as full-time students. While we are proud of the headway we’ve made with regard to standards, I want to assure you that we have not increased them to a level that would limit opportunity for enrollment to any student demonstrating promise for success. As another example, our in-depth review of academic programs has resulted in significant changes. While bringing forward new programs to better meet student and employer demand, we have simultaneously reduced some offerings in under-enrolled programs. We will release information on additional programs, still under development, once all local and state approvals are finalized. Some of these new programs will be offered during next academic year and others will be available in fall 2019. Great strides have also been made in defining the EU Experience, an intentional, integrated experience that combines academic preparation with quality co-curricular activities; fosters leadership and life skills; promotes wellness; and offers experiential learning opportunities. 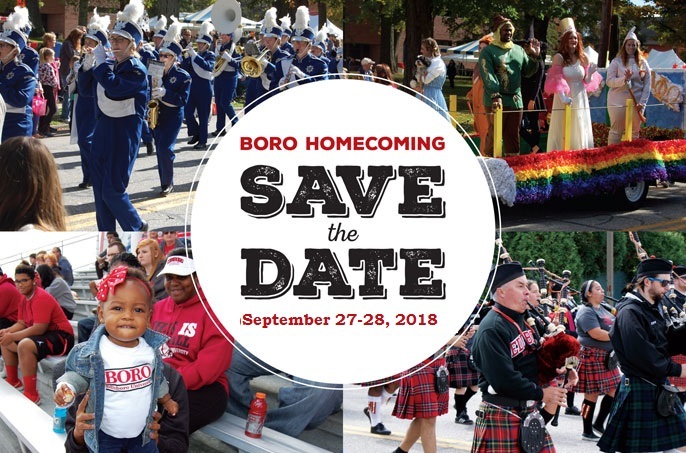 As a community, we will continue to move forward in all of these areas to showcase Edinboro’s value added and to demonstrate why Edinboro is the right place for students to learn, to grow and to chart a course for their futures. As alumni, you understand who we are. You appreciate our values and all that we have to offer. I look forward to keeping you informed and to partnering with you as we continue to adapt to the changing needs of our students and the evolving demands of the workplace. For 160 years, Edinboro has transformed the lives of generations of students. It is a proud legacy. Working together, we will continue to build on that legacy to ensure we provide transformational experiences for generations to come. Dr. Hannan recently spoke with Lisa Adams of Erie News Now about the future of Edinboro and its commitment to student success. You can view the entire interview here: Erie News Now Insider. Amanda Brown Sissem, an Erie native with more than 20 years of experience in nonprofit leadership, joined Edinboro University as the director of alumni engagement on June 11. 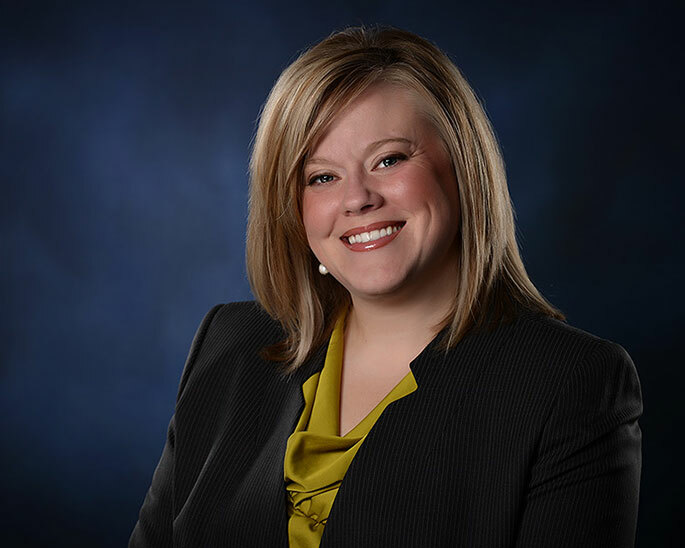 In her new role, Amanda will oversee all aspects of Edinboro University alumni services and growth, including implementation and promotion of programs that strategically engage alumni and enhance participation. She will also manage the Distinguished Alumni Program at Edinboro and serve as the primary liaison to the Edinboro Alumni Association.“Alumni engagement is about creating opportunities to keep students connected beyond their campus years to the people, places and resources that can continue to benefit their careers and their lives,” Sissem said. “This is an exciting time, and I look forward to engaging our Alumni in shaping the University and the region’s future.” Amanda can be reached at asissem@edinboro.edu or (814) 732-1796. Read more. . .
We hope you enjoy the Summer Newsletter and when you are back in the 'Boro, please stop in the alumni house and say hello and take a photo in front of our new selfie wall! 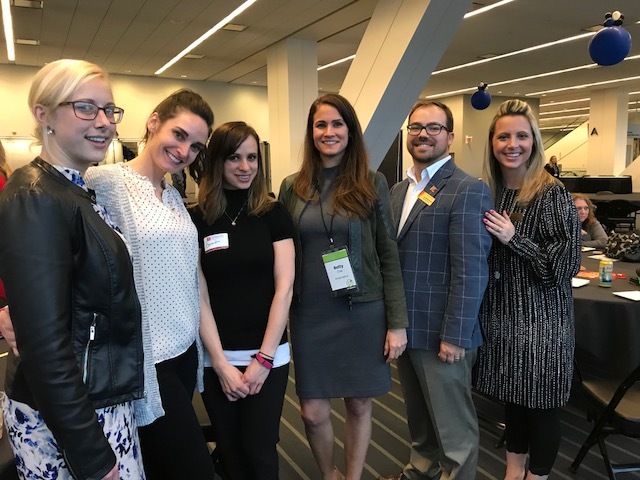 Young alumni gathered recently at the Pittsburgh Business Show. From left to right: Courtney Hoffman '09, Elizabeth Kantz '09, Cassandra Boni '09, Betty Cruz '09, Alumni Association President, Scott Irlbacher '04 & '06, and annual fund director, Jessica Gray, '08. Make a difference in the lives of our students by supporting our first Crowdfunding Cammpaign at Edinboro University for a new BORO Pit. 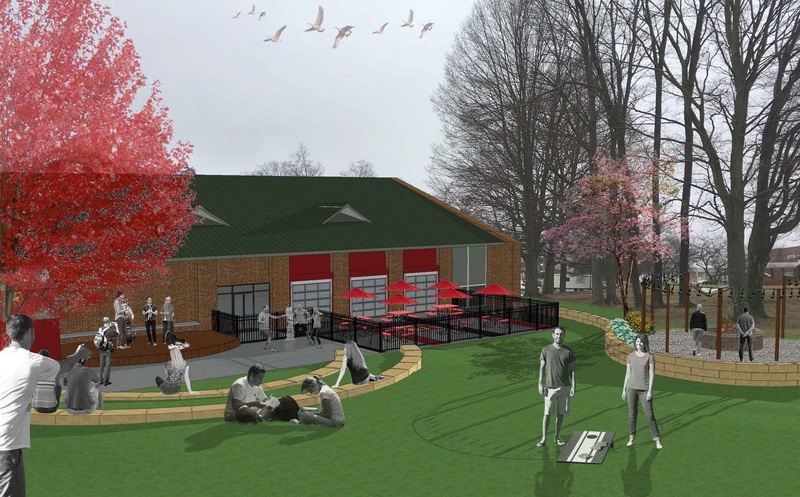 Your gift will help fund a unique outdoor venue for students, faculty, staff, alumni and the community to relax, unwind, socialize, study and dine. Read more. . . This month, Erie Reader selected Monica Clem, Edinboro’s executive director for Career Development and Experiential Learning, and Jessica Gray, director of Edinboro’s Annual Fund, for the annual “40 Under 40” list, which highlights young professionals of Erie County. Read more. . .
Women's Philanthropy Council - The Power of Women! The Women’s Philanthropy Council (WPC) continues to make a significant impact on women at Edinboro University! Read about the transformational and educational opportunities that have been provided for Edinboro University's female students and faculty in our most recent WPC newsletter that can be found on the link below. 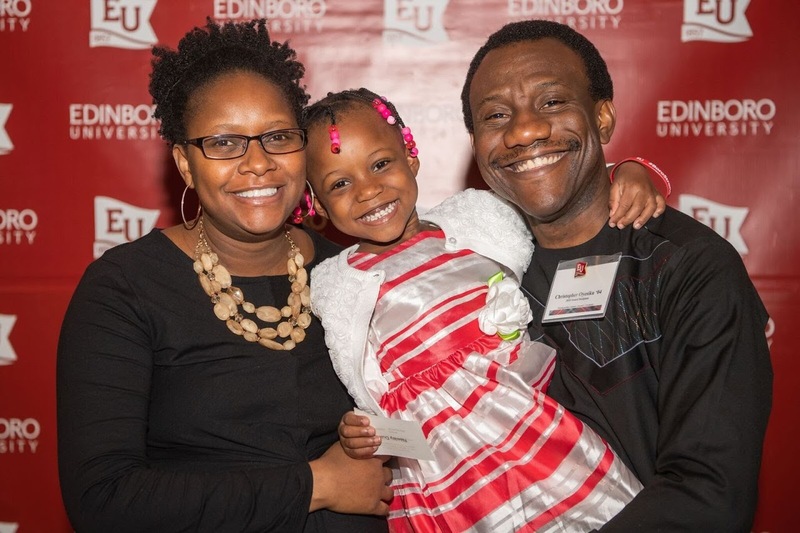 Christopher Oyesiku (’04), pictured here with wife Thelma and daughter, was one of three distinguished alumni honored on April 28 with a distinguished alumni award from the College of Science and Health Professions. He is a team leader for software development and integrations at Logistics Plus in Erie. He earned his Bachelor of Science in Computer Science and minor in mathematics from Edinboro in 2004. Read more. . .
After graduating from Edinboro in 1980 with a degree in geology, David Allard had a varied career of over 35 years as a petroleum geologist, playing a part in many new field discoveries, publications and public presentations. He began working as a geologist in the oil business in San Francisco, California after leaving the 'Boro. He moved to Midland, Texas to work for a major oil and gas company in 1981 and in 1988 moved to Houston to work on international projects with that company, involving extensive travels. He joined an independent oil and gas company in 1998, moving his family to Egypt; then five years later, transferred to Scotland. David took on management roles of increasing responsibility starting in 2000 to the present. He returned to the U.S. in 2006 to work in Tulsa, OK, Houston and finally to Denver. 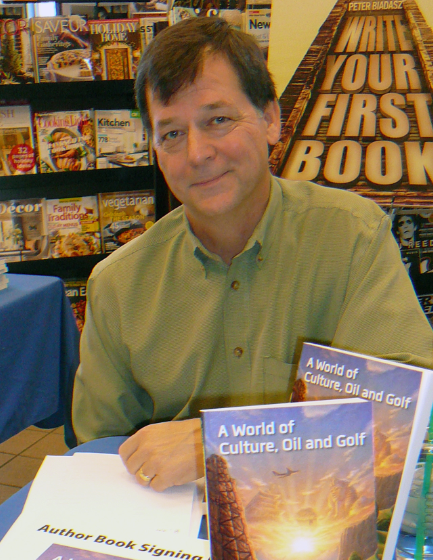 David presents interesting stories from far flung parts of the world in his book “A World of Culture, Oil and Golf”. He compiled journals during while working in more than 20 different countries. His observations of how the international oil business works in different cultures, the above ground and below ground risks in various countries, are the basis for this book. 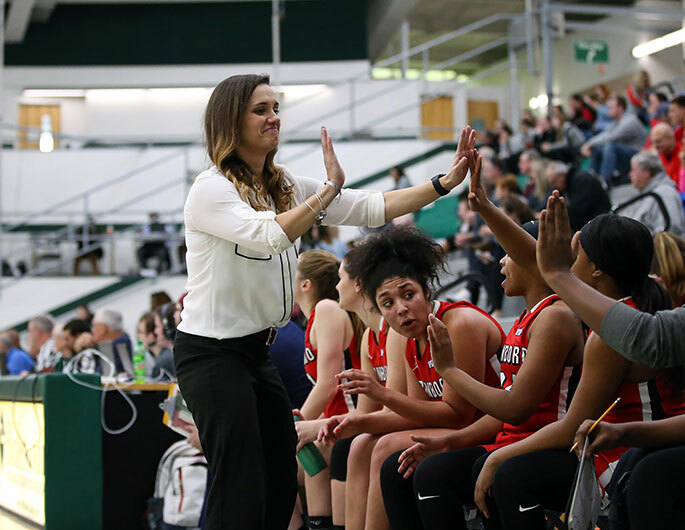 Edinboro University didn’t have to look far to find a replacement for long-time women’s basketball coach Stan Swank. Interim Director of Athletics Dr. Katherine Robbins announced the hiring of assistant coach Callie Wheeler as Edinboro’s fifth head coach of the women’s basketball program. Swank had previously announced his retirement. “It is an honor to be selected the next head women’s basketball coach at Edinboro University and I am humbled and excited for the opportunity,” Wheeler commented. “I would like to thank President Dr. Michael Hannan, Athletic Directors Katherine Robbins, Bruce Baumgartner, and Edinboro University for their confidence in me. I am extremely grateful that my family and I get this opportunity to be a special part of the Edinboro University Women’s Basketball Family.” Read more. . . 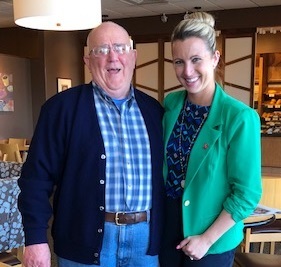 Retired faculty Jim Watson recently visited with director of annual giving, Jessica Gray '08. Mr. Watson retired from the math and computer science department after 30 years as a beloved professor. 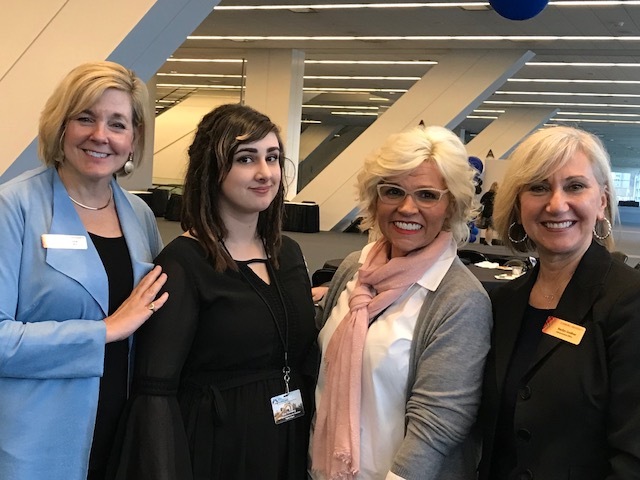 Julie Chacona, major gift officer, Gina Thornberg '18, Linda Jo Thornberg '02, and Marilyn Goellner '01 & '17, vice president for advancement, at the Pittsburgh Business Show. Linda Jo is the President of the Pittsburgh Business Show and her passion has always been business development, working to make sure that people make the right connections to help run their business. Linda Jo was named a 2018 Empowering Woman in Business Award by Inspiring Lives Magazine. 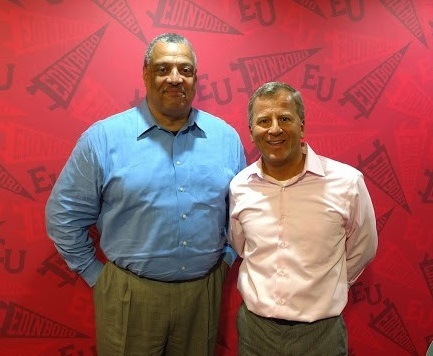 Terrence Patterson '79 and Jon Pulice '90 & '92, director of athletic development, during a a tour of campus. Terry is National Wholesale Director of Sales for Selina Naturally, Celtic Sea Salt. 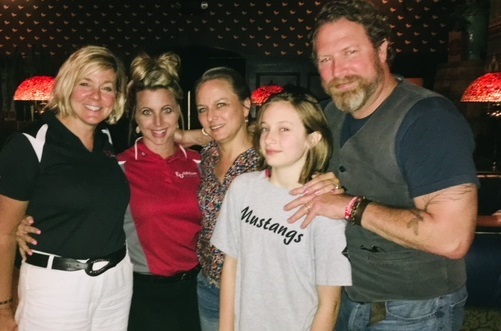 Julie Chacona and Jessica Gray '08 traveled to Ann Arbor, Michigan and met with Rachel '90 and Kevin Spall '90, and their daughter Beatrice. The Spalls will be back on campus next year to jury the 10th Anniversary of the Michael Gmitter Art Show. You have the power to strengthen EU - by giving back! Did you know? You can give a gift of appreciated stock or a donation from your IRA or other retirement plan and realize tax savings. For more information: Planned Giving. Check out EU's new Legacy Endowment which has an immediate impact for our students while creating a permanent legacy in your name.